FC Barcelona and James Costos, the former United States Ambassador to Spain and Andorra, have signed an agreement as part of the club’s expansion plans. Costos will be taking up a new position as strategic advisor in America, where he’ll be involved in three key projects, the FC Barcelona Foundation, the Barça Innovation Hub and the development of the FC Barcelona brand in the North American market. Costos and Bartomeu put pen to paper in the latter’s office at the Camp Nou, where they were joined by FC Barcelona CEO Óscar Grau and Javier Sobrino, director of Strategic Planning and Innovation. After signing the agreement, everyone present started discussing possible actions on occasion of the Barça first team’s trip to the United States in July, where they’ll be playing in New York, Washington DC and Miami. James Costos is a US diplomat and former ambassador for the United States to Spain and the Andorra. While serving in the role, and since, he has focused hard on building links between the U.S., Spain and Andorra, working towards such shared targets as increasing prosperity, improving security and ensuring respect for human rights. A second generation Greek American, Ambassador Costos was born in 1963 and grew up in Lowell, Massachusetts. In 1985 he graduated in Political Science at the University of Massachusetts. Costos was a corporate and executive manager in the retail and entertainment industry, most notable at HBO where his roles for different companies included global positioning, external relations, marketing and communication. He has a passion for humanitarian and cultural organizations and is a firm advocate of cultural diplomacy. Costos divides his time between Los Angeles, New York and Madrid and has frequently declared his strong support for FC Barcelona. And from now on, he’ll be collaborating with the club as its strategic advisor in America. “James Costos is a very important person for us who is very well positioned in the United States, a country where FC Barcelona’s presence is getting bigger and bigger, not just through the commercial office in New York but also through our schools, academies and now women’s soccer too”. “For all our dealings with the country through sponsors and partners, we needed somebody of his status. Somebody who can represent Barça on strategic matters, evidently also with Foundation matters, and most of all for issues in relation to the Barça Innovation Hub. We have already made many agreements with several universities but we needed a strategic advisor like James Costos so that we can enter this country with even greater strength”. “The United States is a country where Barça has made the perfect entry and we have been making big investments for many years, along with such business partners as Nike. 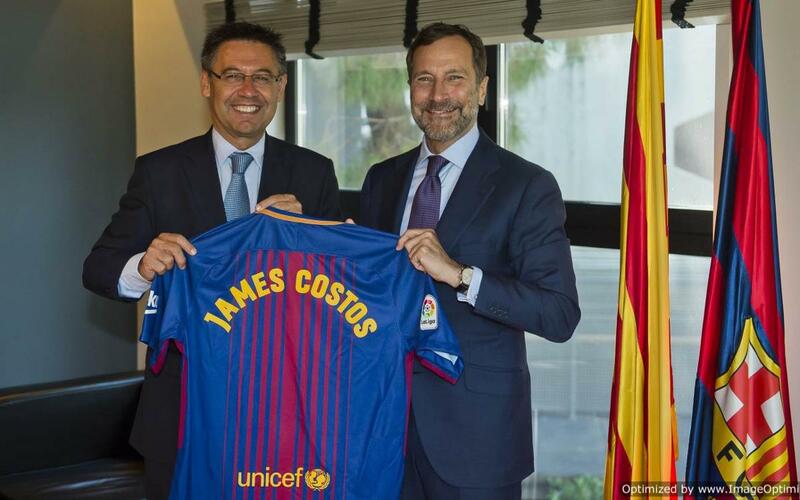 All in all, a person like James Costos, a highly prestigious advisor, who has such incredible contacts in the country, who has worked in this area for years, and who also feels so much for the Barça colors, will play a very important role in Barça’s development. We want to keep growing in the United States, we want to find more partner, more supporters, and in that regard James will do a wonderful job for the club”. “It is one of the greatest honors of my life to be able to represent Barça in America and I am highly motivated to build links between U.S. institutions and FC Barcelona. A very good job has been done, and there is still a lot more to be done when I go back to the United States, above all through the FCB Escola soccer schools, the Foundation and the Barça Innovation Hub, which add so much value to the club”.